No. When you talk about plants, or an ecological system or forest, things are very easy if you decide that bad people ruined it. But that’s not what humans have been doing. It’s not bad people who are destroying forests. Hayao Miyazaki’s Princess Mononoke follows a young native Japanese (Emishi) prince named Ashitaka. In the opening sequence, a dying boar demon curses him, leaving him exiled from his dwindling tribe and seeking the source of his affliction. He discovers that the demon was in fact a transformed boar god, shot by a bullet made in Iron Town, a new industrial city in the midst of Muromachi Japan run by Lady Eboshi. Eboshi is a proto-bourgeois revolutionary who provides dignified labour for lepers and prostitutes while laying waste to nearby forests to feed the forges and waging a war of attrition against the nature gods guarding the trees. These gods––gigantic wolves and boars with the gift of speech––are joined by a human raised by wolves named San, AKA Princess Mononoke, who tries to assassinate Eboshi. By the end of the film, Eboshi’s town is wrecked but the nature gods are dead for good, lying in heaps of corpses or dissolving into the ether. Nature, the film implies, is now open season for exploitation by humans who no longer have anything to fear from forests. All that said, what does this have to do with history? For our final session in HIST 356 (US Social and Cultural History) this year, coincidentally my last-ever Calvin class period, Professor Du Mez asked us to participate in some intellectual show-and-tell. Our assignment: present a text that contained meaningful commentary on “Christian history.” I chose a different tack, presenting the film Princess Mononoke because it embodies my core historical commitments. Because it’s a film, and animated at that, it’s not a manual about the mechanics of writing history––I read plenty of those at Calvin––but it gave me an ethos. Translated to sturdy English, Princess Mononoke taught me the emotions and ethics of my chosen discipline. And those two are rarely ever apart because emotions are always at the core of ethical motivations, for better and for worse. 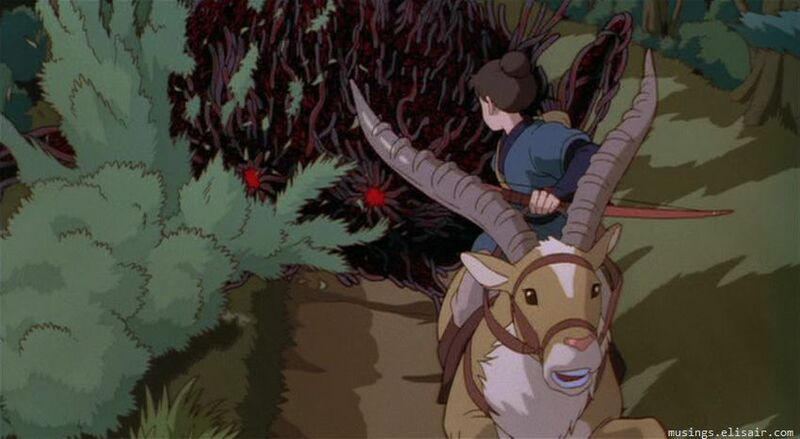 What makes Princess Mononoke a great piece of historical fantasy is that it studies interlocking systems in motion without a transcendent moral reference point. Ashitaka, the forest gods, and Lady Eboshi act rationally according to their flawed perceptions, with their bodies being the pivot points of their motivations. Eboshi is motivated by saving lepers and prostitutes, but whole natural systems suffer immense pain and degradation because of her actions. Ashitaka wants to heal a poison in his body, to purge the mark of death on his arm. The forest gods are likewise attempting to purge, in a suicidal last charge, the smoke-belching tumor eating away at their forest. Humanity under capitalism, with its unquenchable growth imperative and heedlessness about the health of the natural body it lives on, is animalkind gone cancerous. 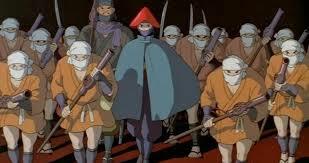 But then again: Eboshi gives her people a better life. She is not a tyrant, neither duplicitous nor rapacious. She values life––but only human life, which she believes to be separate from nature. 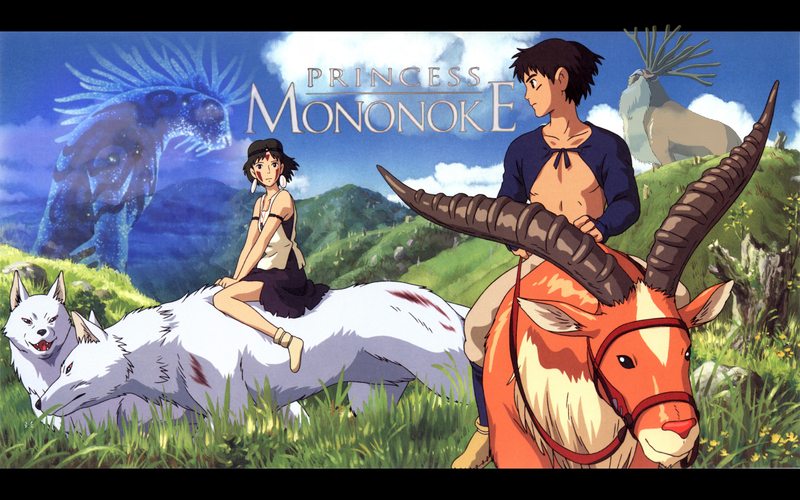 Princess Mononoke dramatizes the real struggles that drive history. I dare not say drive it forward, but the forces of class struggle, of gender struggle, and of struggle against depredation and land theft by indigenous movements are what is foundational. These are not moral struggles in the simple sense we see in Captain Planet. “Ordinary” people destroy forests all the time. What is true in history is systems in motion, hungry systems that need energy to stop themselves from disintegrating into pure entropy, not to mention space to export all the waste and chaos they produce. And, at this moment in time, it’s capitalism in particular that lacks the parasitic smarts to not actively destroy its food source, literally and figuratively. When I was writing my honor’s thesis on American-Iranian relations, this point came home to me more strongly than before. The Americans, Iranians, and Russians were not, individually, more or less moral than their antagonists. They were all members of state systems and an international system, all in ruts of their own making, predisposed to believing convenient illusions, or what Spinoza calls inadequate ideas. Princess Mononoke teaches that historical ethics start with, in Brian Massumi’s words, “the real monism of matter…one world, one nature…one unified field.” (A User’s Guide to Capitalism and Schizophrenia, 1992). If historians’ words are to be the light of (partial) truth, and not the whispers of modern court magicians, we cannot pretend we have charmed spectacles that tell us Good from Evil. We need to be physicians, understanding that our patient, the totality of human society through time, is a body with its own dynamics that needs to be understood on its own terms. For my part, the broad and straight road to transcendent moral judgment is closed, leaving open only the winding and arduous work of investigation and often uneasy political judgments. Princess Mononoke teaches this viscerally by giving us characters so organic that they short-circuit simplified moral questions of Good and Evil and force us to ask: but what is good for nature and for humans? Jonathan Hielkema graduated with honors in history in 2015. This entry was posted in Student Voices and tagged alumni voices, capitalism, film, historiography, history, Princess Mononoke, student voices, students. Bookmark the permalink. A piece that my human editor wrote for his alma mater’s history department blog earlier this summer. It’s a fine piece of writing for a human being.